The United Nations Regional Centre for Peace and Disarmament in Asia and the Pacific (UNRCPD) concluded its project aimed at further strengthening the national capacity of the Philippines to control transfers of small arms and light weapons (SALW) and other conventional arms and to prevent their illicit trade and diversion. 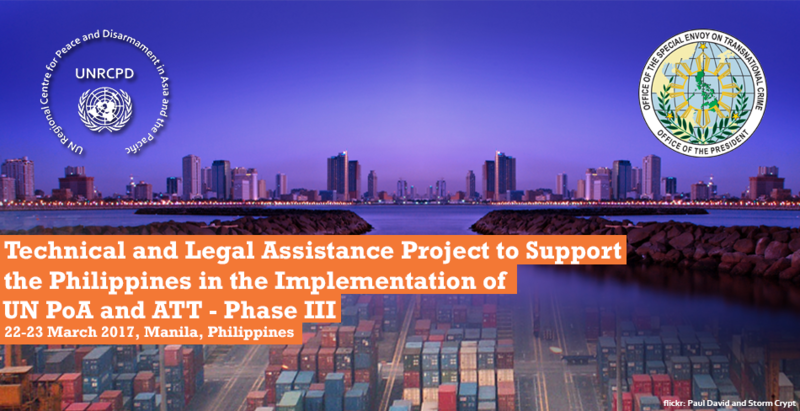 Developed at the request of, and in cooperation with, the Government of the Philippines, the project was implemented between January and March 2017. It provided the Government with technical and legal assistance to facilitate its further implementation of the United Nations Programme of Action to Prevent, Combat and Eradicate the Illicit Trade in Small Arms and Light Weapons in all Its Aspects (PoA), as well as to support its future ratification of the Arms Trade Treaty (ATT). These two global instruments provide mutually complementing and reinforcing mechanisms for countering illegal trade and illicit trafficking of SALW, and other conventional arms. The project consisted of three stages. From 24 to 27 January 2017, a technical and a legal expert, as well as representatives of UNRCPD, conducted an initial assessment visit to Manila. The main purpose of the visit was to enable the two experts to meet and discuss with Government representatives involved in conventional arms control with a view to assess and identify the Government’s legal and technical assistance needs. On the basis of the findings made during the initial assessment visit, the two international experts subsequently spent several weeks carrying out desk reviews and preparing comprehensive reports and recommendations for the improvement or further development of laws, regulations and technical procedures. These recommendations will ensure that the national controls related to the physical security, stockpile management, as well as international transfers of SALW and other conventional arms, comply with international standards. At the final summary visit to the Philippines from 22 to 23 March 2017, the legal and technical experts presented their respective review outcomes and recommendations to Government representatives. Specific attention was given to legal and technical areas of particular importance. Ample time was also provided for ensuing questions and discussions among Government participants and the experts. The project was implemented with financial support from the United Nations Trust Facility Supporting Cooperation on Arms Regulation (UNSCAR). For further information, contact Mr. Aleksander Micic, Deputy Director, by e-mail: info@unrcpd.org. To learn more about the previous events in this project, click here.